Nightlife advice and Tips for newbies! Many ladies working in the bars in Pattaya can be taken out of the bar for the evening. If the young lady agrees to your request to go with you, a bar fine is required to be paid. (If the girl leaves with you during normal working hours.) The bar fine will vary in cost depending on which bar you found your night’s true love! You are well advised to negotiate how much money she requires on top of the bar fine before you leave the bar. Girls in Pattaya charge anywhere between 1000 to several thousand Baht, depending on where they work and how gorgeous they are and if you asked for short or long time! (Short time is normal an hour or two tops, you come and she goes! Long time is all night.) If you ever have any disputes or problems such as a missing wallet, smart phone etc. after your sordid night out then at least you can talk to the girl’s mama-sun or bar manager regarding the potential suspect. Freelance girls you need to be more careful with! If you buy a bar girl or coyote dancer a drink, this is known as a lady drink! They cost more than regular drinks and the girl gets a commission too. It is not compulsory to buy the girl you’re chatting to a drink, although it is expected. Some girls are really pushy and will say “you buy me dink mister?” It’s much nicer to be able to offer rather than be accosted in this crude manor, it’s best to avoid girls like this because generally what happens is you buy her a drink, then she says “I go dance now” or “I go talk my friend” and leaves you to chat to a regular customer. Nice! You could ask the overly assertive wench to buy you a drink, she will probably call you a cheap Charlie, or something far worse in Thai! Pattaya Lady Drink prices tend not to be overly expensive, you can always check prices before you buy so you don’t leave yourself without enough money for the bar fine later! You shouldn’t assume that all young Thai ladies you meet in the Disco bars in Pattaya are freelancers. Obviously, some are. You can meet all sorts of nice young professional ladies in the clubs, ask what they do for a living if you’re curious. If the answer is vague or I work as a cashier, chances are she’s on the game. As mentioned before, be careful when picking up a freelance girl. It’s best not to take her back to your hotel or property if you live in Pattaya. Stick to renting a good short time or alternative hotel room for the night and keep your valuables locked up! There is a much higher chance of being robbed by a freelance girl as there is no come back with the club, they might not even know who she is. Freelance lady boys are worse still when it comes to ripping off clients. Also known as Katoeys are very popular in Pattaya it seems! Many are often first mistaken for being female as they can be very beautiful. Easy to spot signs are height, size of hands and feet, deeper voice and there is the good old Crocodile Dundee test! (Although some strap up well and some have had the op!) 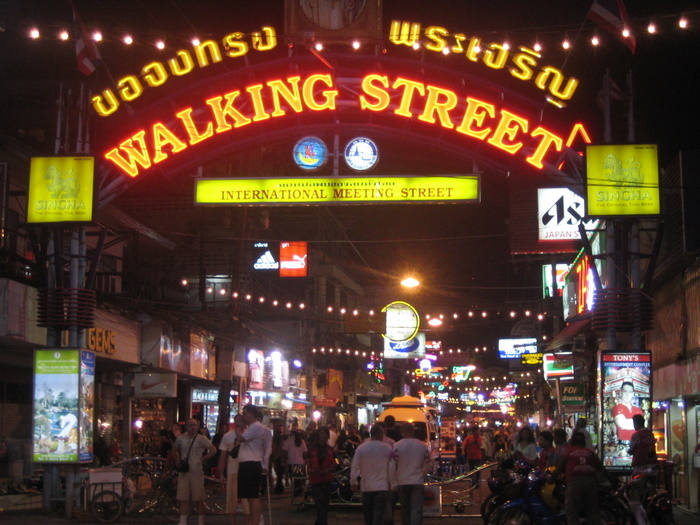 Waking street is adorned with freelance lady boys, often in and out of trouble with the Tourist Police! There are lady boy bars too, such as Pook bar on Soi Buakhao. If you like something different, you’re much better off bar fining a nice lady boy from a reputable bar than picking up a freelance Yabba addict. Also remember, these are Thai guys and they fight like Thai guys. One of you and 6 of them! 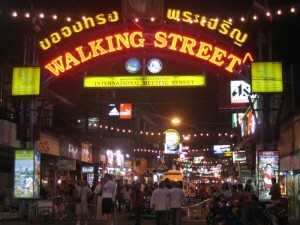 Pattaya for the main part is a rather safe seaside city to go party! There are a few things to look out for though. Beach road after dark – Lady Boys harassing people, pick pockets too! Also be careful not to carry a nice bag on your road side shoulder. Bag snatching – is unfortunately on the rise recently. Guys with a pillion thief on motorcycles drive at speed and grab ladies bags. It’s best not to hang on either else they will drag you up the road! Gold chains – duh? Don’t wear expensive gold chains on beach road after dark, or on Walking Street. Do so at your own peril!